All kinds of yummy things here, from a sweet Cat and the Fiddle image to hand-tinted postcards of Pierrot and/or vintage beauties posing with the moon. This sheet is also included in the Cards & Constellations Kit; see all the other kit components. 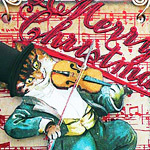 Merry Catmas ATC by Teri Calia, created for The Twelve Days of Christmas; other components in the artwork. More photos from the ATCs in the project are in the gallery.